Gladiators were the ultimate one on one fighting machines, they lived, ate, breathed and slept combat. Steeped in mysticism and bravado, the Gladiator warriors were the entertainment for a blood thirsty Roman society, and they delivered in true Gladiatorial style. The Gladiator name actually comes from the name of a sword the Gladius, which was the popular Roman weapon of the Roman army. A Gladiator was considered in Latin terms to mean Swordsman, yet in later days the Gladiators would have master more than just one weapon to keep their lives. Around the 1st Century BCE to the 2nd Century CE the gladiatorial arena was at its peak popularity. the games were still popular even when the Roman state was falling rapidly into decline which is testament to the drawing power of the Gladiator Warriors. Gladiators were bound by oath to their owner and they could be a slave who was forced into fighting, or they might choose of their own accord to become a warrior in the gladiator arena. Both men and women could be a Gladiator and Rome was not afraid of allowing women to fight in the most unforgiving arena of the time. It was also possible that a gladiator would not be pit against another human but would be faced against a beast, a lion or a tiger which would present its own set of challenges. The original gladiators were believed to be slaves or thieves and criminals who were forced to face each other to the death, this was believed to have evolved into the more organised and more open gladiatorial rules. The owners of the Gladiators would usually be wealthy individuals who would organize gladiatorial displays to show how wealthy they were, this would be a valid sign of a status in the Roman community. Gladiators could be expensive to keep due to doctor bills, training and food supplies. 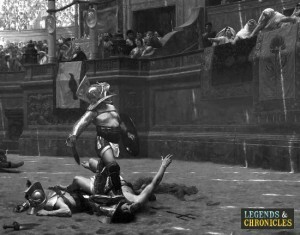 The Gladiator shows in Ancient Rome would feature a mix of different Gladiator warriors, each with their own unique style and weapon choices. 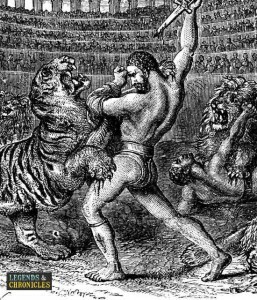 While there were a mix of various types of Gladiators including animal trainers like the Bestiarii who typically fought and performed tricks with animals, in this section we will focus typically on the foot fighters, the gladiators who typically faced another gladiator. The Dimachaeri gladiator was possibly the lightest armoured warrior. With only small armour on possibly the arms or legs in the form of padding or small plates, the Dimacheari would have no shield. For attacks the Dimachearus would use two swords, which in combination they could also use as a makeshift shield. The Gaul was a Celtic Gladiator, captured by the Romans, the Gaul would have to fight in the arena. Armed with their typical weapons the Gaul would have a shield and a sword in most cases with no body armour. The Murmillo gladiator were armoured with a large metal plumed helmet which encases the whole head, and wore leg armour. The Murmillo would be armed with a large shield and a gladius sword for attacking. The Hoplomachus gladiator were armoured with quilted padding on one arm and both legs and wore a full enclosed helmet. The Hoplomachus would be armed with a small circular shield, a knife and a spear for mid range attacks. Often called the ‘net fighters’ the Retiarius were partially armoured with an arm guard that covered part of their shoulder and chest. The Retiarius gladiators fought with a trident, a net and a dagger in case they lost their trident. The Samnite Gladiator was considered to be a heavily armoured fighter, with a large and tall rectangular shield to fend off blows, and a short sword to thrust and cut their opponents. The Secutor was armoured with a helmet with covered their entire face except for two eye holes, though in part to be due to their pairing with Retiarius fighters to protect their face from the trident. The Secutor was armed with a Gladius and a large shield which it would use to deflect attacks before striking back. The Thraex, often known as the Thracians, wore what many would consider traditional gladiator armour, with leg wrappings, metal shin guards, greaves, an arm guard and a rimmed helmet. The Thraex would carry a curved sword known as the sica and would have a small square shield to defend themselves. The Velites gladiators would be armoured with a small helmet and a circular shield. For attacks the Velites would use javelins and a short short in case they lose all their javelins in battle. The fighting style of the Gladiator warrior was unique, with the wide choice or weapon combinations, each Gladiator would fight in their own bespoke style depending on their gladiator class. With the rigorous training that Gladiators incurred, they were usually adept or at least skilful with most weapons they could bring to arms. The Gladiator warriors used a mix of weapons when doing battle, from swords to harpoons, with the sole intention of inflicting damage on their opponent. In many cases a gladiator would be able to choose his choice of weapons, but typically a gladiator would have to conform to the choices of his fighting class, be it a Dimachaerus fighter or a Hoplomachus. The well known sword the Gladius, which was the weapon of choice for Roman foot troops was popular with gladiators thanks in part to its easy availability and its ability to cut, thrust and chop. The Trident and Net was also a common choice, and used by the Retiarius Gladiators the net to slow and hinder their foe and the trident to block attacks and also deliver damage. If a Gladiator was to lose their fight, their warrior reputation depending on their performance could be tarnished and the spectators of the event would decide if the Gladiator was to survive. The umpire in the arena would either be watching from the sidelines or holding the successful gladiators arm stopping them from delivering the final strike of the their down opponents life, if the crowd deemed it necessary. Whatever the reasons for being in the arena, a winning gladiator would be the star of the moment and after the fight was fought, and the winner announced the noise of the crowd would be deafening, chants for the Gladiators name, screams and whoops would be heard. That was of course if you ever lived to see that day, in the life of a Gladiator.